The patented Edelbrock/Steele Series 1 Nozzle is one of the most advanced in the industry. With its unique fuel passage design, this nozzle gives extremely high atomization and is the key to the outstanding performance of the Edelbrock/Steele Nitrous Kits. One of the most effective ways to increase atomization is to increase the fuel pressure. Incorporating this exclusive design, the Series 1 nozzle allows the use of 5 to 20 lbs. of fuel pressure...over six times higher fuel pressure than the competition...for a complete burn process in the combustion chamber that results in more horsepower. Specially designed fuel outlets enhance atomization, even at lower fuel pressures. Multiple radiuses are used at the nitrous outlet to give the least amount of turbulence and a more precise nitrous spray. The unique fuel delivery angle ensures a complete mixing of nitrous and fuel for optimum atomization. Developed with the help of NMRA Pro 5.0 racer Billy Glidden, these nozzles are capable of producing 500+ HP using a single-stage, direct port injection system with zero engine damage! They are CNC machined from stainless steel for maximum performance and reliability and are compatible with all Edelbrock stainless steel jets. These nozzles pre-atomize the fuel before it mixes with the nitrous, producing a better, more homogenous mixture. The 90°, 1/16'' NPT design is a direct bolt-on upgrade for outdated competitor's nozzles. These nozzles were so tuner friendly that Glidden and his team were able to go 45 runs before tearing down the engine in their black Super Street Outlaw Mustang! Edelbrock's new E3 Titanium Direct Port Nozzles kits are the latest design for all-out competition, producing the highest power output of any nozzle currently available. 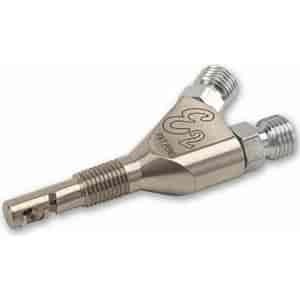 The straight-shot configuration and unique tip design on these E3 nozzles produce excellent fuel atomization, necessary to realize the performance benefits of nitrous. Their exclusive titanium construction makes these nozzles the lightest, strongest and simply the best nozzles available. The E3 Nozzles kits are designed for use on Edelbrock's Super Victor direct port nitrous systems, which offer power increases ranging from 200 to 500-plus horsepower. 350-71852 is the Super Victor V8 direct port kit and 350-71853 is a basic plumb kit for the racer to convert over to the Edelbrock Super Victor V8 direct port. Some of the outstanding features include the straight shot design, 1/16" NPT threads, and superior fuel and nitrous mixing. It is important to note that due to the straight shot design, this is not a direct replacement for a 90-degree-style nozzle. This nozzle is to be mounted to the manifold runner at a steep angle (45 degrees or less in most cases). Due to this placement, these nozzles can be mounted and plumbed closer to the manifold than conventional nozzles, thus minimizing the need for hood and/or scoop modification.